It's not easy finding dance classes that fit a night-flying little vampire's schedule, but little Vampirina finally locates a ballet night school that opens by moonlight. The black practice leotard and tights are her color, but her gauzy cape definitely sets her apart among her pink-preferring partners. Vamparina also hits another snag: it's hard to perfect your plie' pose when you can't see yourself in the floor-to-ceiling mirrors. But our little vampirette, fangs and all, perseveres and looks to be a natural en pointe! "EVEN THOUGH IT WOULD MAKE YOUR GRAND JETE' MOST IMPRESSIVE, RESIST THE TEMPTATION TO TURN INTO A BAT!" 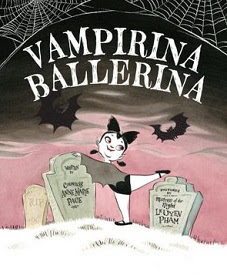 Self-billed author "Countess" Anna Marie Pace and artist "Mistress-of-the-Night" Leuyen Pham combine their dark arts happily in their brand-new Vampirina Ballerina (Hyperion, 2012), which ends in a delightful four-page gatefold which opens to show the entire corps de ballet receiving their "Bravas" after the final tour jete'. A tale for the upcoming scary season which will please young dancers and would-be ballerinas any time. "The underlying messages are familiar: there are no shortcuts to achieving an ambitious dream, and persistence and a sunny outlook (even when one is a creature of the night) pay off. But seldom have these lessons been expounded with so much charm," says Publisher's Weekly.